Thirty years ago, Nina Natelson was appalled to see animals widely mistreated in Israel. She decided it was high time to address the problem—and that has made a world of difference. Saturday, a horse rescued by Nina Natelson's organization CHAI - Concern for Helping Animals in Israel. In 1983, when Nina Natelson visited cousins in Israel, almost everywhere she went she saw animals suffering. “I cried my way through the country,” she says. Natelson spotted donkeys with burdens too heavy for their compact frames to carry; emaciated dogs wandering on the beach in Eilat; and when she ate at cafes, she would feed starving stray cats under the table, despite the objections of her relatives. Because of the warm climate, stray dogs and cats are a major issue in the country. Yet, at that time, the animal rights community in Israel was in its infancy. What shelters that did exist were ill-equipped and not geared either to spaying and neutering or animal adoptions. Cats were considered vermin and few people brought pets into their homes. Strychnine was used as a method of animal control. “We’ve been busy building a country. We’ll get around to taking care of our animals,” Natelson was told repeatedly when she expressed her horror at the conditions for animals. Natelson decided it was high time to address the problem. Though she had only two years’ previous experience in the non-profit world, she returned home to the U.S. and founded a non-profit organization: Chai: Concern for Helping Animals in Israel. Under Natelson’s leadership, Chai has helped to transform how animals are regarded and treated in the country. Chai spurred the first animal protection legislation in Israel; pioneered professional conferences for vets and heads of shelters as well as humane education initiatives; provided critical assistance to new and existing shelters; promoted early-age spaying and neutering, and imported the Middle East’s first animal rescue vehicle and the first mobile spay and neuter clinic; provided a lifeline to animals, especially during times of war and crisis; and lobbied the government to administer the humane oral rabies vaccine to replace the slow, painful strychnine poisonings. For many years, Natelson, now 66 and living in northern Virginia, visited Israel multiple times a year to oversee on-site work. Now, thanks to the creation of Hakol Chai, its sister charity in Israel, she is able to go less often, while still providing expertise and supervision as well as raising funds for projects. Saturday and Shai, two rescued horses. Avi, Hakol Chai's photographer, with parakeets in Gaza. 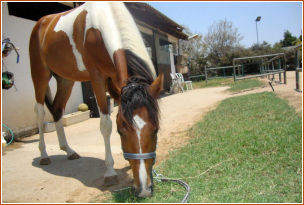 Joey, a starved and neglected horse that was rescued by Hakol Chai in 2012. Five months later, Joey is thriving. Protesters at the Earthlings - No Longer Blind to Injustice - International March for Animal Liberation in Tel Aviv. An emaciated horse in Israel. A Hakol Chai volunteer feeding cats next to a bombed car. Saturday, a rescued horse, recovered. Inside CHAI's mobile spay/neuter clinic. CHAI succeeded in having horse carts banned on city streets in Israel. Puppies rescued from a warzone in the north. Among Chai’s greatest champions, says Natelson, were the late California Congressman Tom Lantos and his wife Annette, who served on the organization’s Board of Advisors. Time and again, the couple used their influence, bringing up in meetings with Israeli government officials the issue of how animals were treated. It was a phone call from Annette Lantos that broke through the resistance of municipal officials in Tel Aviv to designate a piece of land for a modern shelter. Tom and Annette Lantos in 2009. And it was intervention from Congressman Lantos that helped Chai gain entrée to Israel’s Ministry of Education, eliciting its support for educational activities to encourage respect and empathy for animals. Skeptical Ministry officials were surprised when over 1,200 professionals asked to attend a 1994 conference, “Preventing Violence in Society through Education,” which explored the link between child abuse and animal abuse. 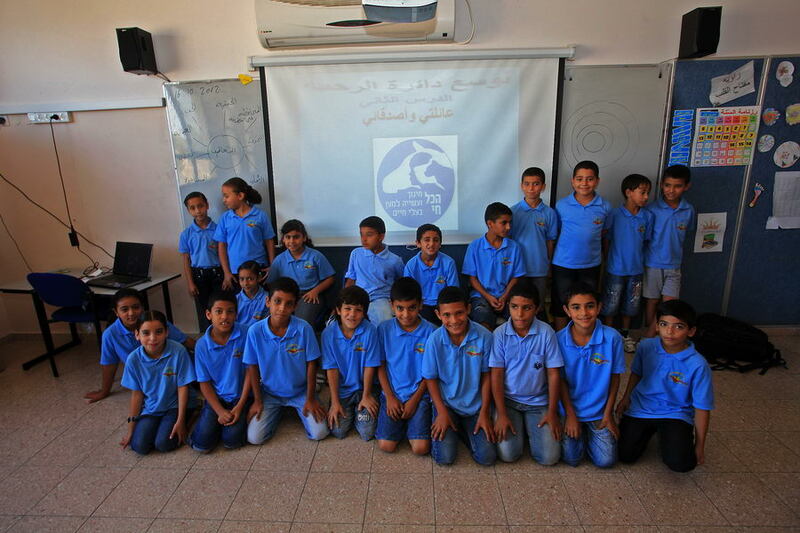 Responses such as this set the stage for Chai’s ongoing collaboration with the Ministry on a number of humane education projects in Israeli schools. In one of its recent undertakings, CHAI and Hakol Chai, with the cooperation of the Ministry, sponsored "Expanding the Circle of Compassion," the first humane education conference for Arab educators in Israel, and these educators have brought the program to Arab students. “Humane education goes to the root of the problem,” says Natelson. “Studies show that if you expose students to humane education for at least one year in school, attitudes are permanently changed,” she says. Now Natelson and her husband, a psychiatrist, are down to five cats and three dogs (at one time they had 11 animals), one of which is a toy poodle that sits in her husband’s—or his patients’ lap—during sessions. One of Chai’s recent successes is a nationwide ban on horse-drawn carts on urban roads that was passed in October 2014. The animals were used to carry heavy loads of furniture, rocks from construction sites, and watermelons and other fruits and vegetables, often while being poorly fed and given minimal, if any, veterinary care. The ban was the culmination of a 10-year effort to end horse and donkey abuse which included exposés, education, public demonstrations and rescue and rehabilitation of abused horses and donkeys. Plans are underway to create a sanctuary for animals removed from abusers.